Some people have weird feelings about pet strollers, but I never gave them much thought until I realized I was going to need one.  Cupcake and I have an event coming up in March where we will be out in public and on the go for several hours. Although I have carried her around a store for up to an hour, Cupcake starts to get heavy after a while, so getting her own set of wheels seemed most practical. 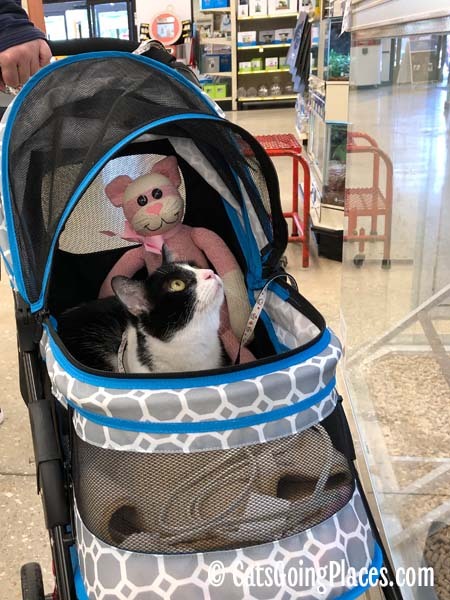 Just after Thanksgiving, Cupcake and I were visiting our local HomeGoods store when I spotted a Gen7Pets Regal Plus stroller for sale. “What do you think, Cupcake?” I asked, putting her in it. It was a good fit for her. I liked that there was plenty of mesh on the front of the stroller to make her visible when she hung out in the back of the stroller. Cupcake thought it was strange behavior on my part, and she almost immediately scrambled back up into my arms. We took the stroller with us, to the amusement of the checkout staff. Cupcake had her Cupcake Cruiser at last. We had our first lesson in folding the stroller while we were in the parking lot to take it home. It’s easy to fold, but it is a two-handed operation. As soon as the stroller was home, I set it up in the sunroom with a fluffy blanket. It wasn’t long before Cupcake was hanging out in there, wrestling with the blanket. 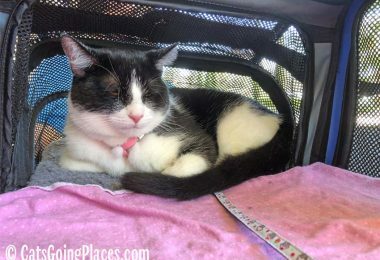 Cupcake has blanket issues and will remove them from her carrier or stroller and drag them through the house to hidden locations under the bed. I often found her inside the stroller next to a wadded-up blanket. 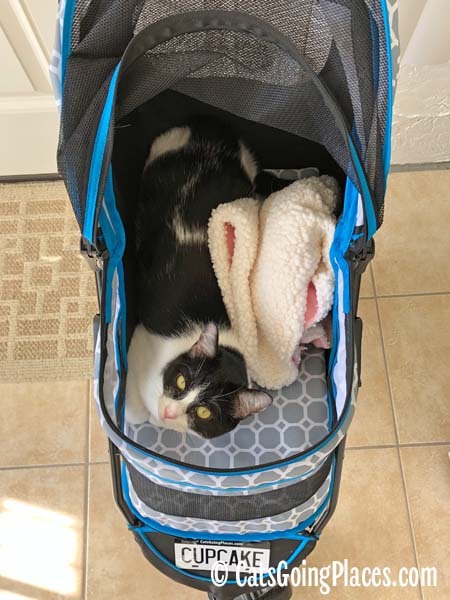 Since it was winter, I tucked a small pet bed warmer I had on hand under the blanket and plugged it in to make the stroller more attractive for lounging than wrestling. Then I ended up in the hospital, and Cupcake’s foster mom sent me a stuffed sock monkey-cat as a get-well gift. 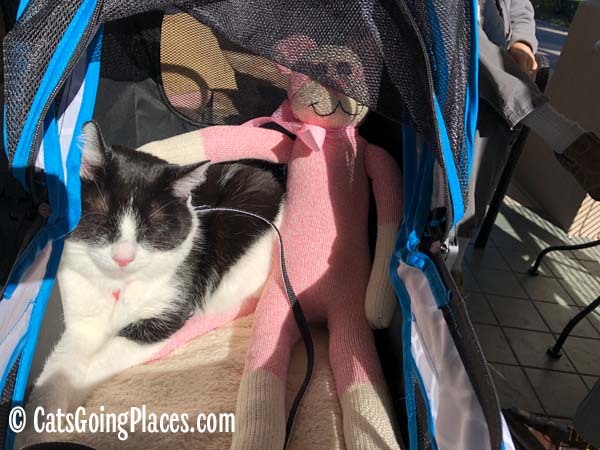 Cupcake loves her monkey toys, so i tucked Catmonkey into her stroller to give her someone to snuggle with. 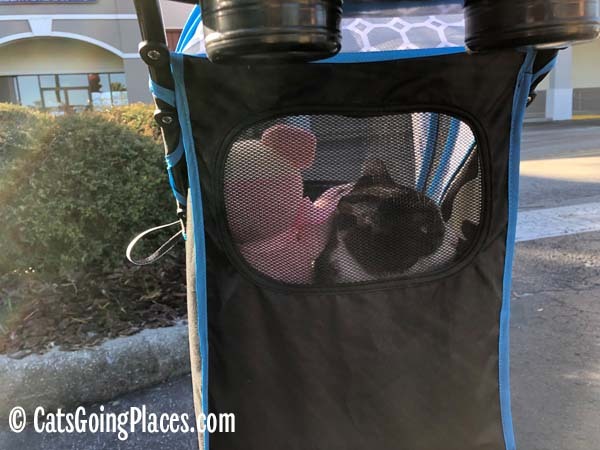 Catmonkey became Cupcake’s travel buddy, and rides in the stroller on our outings. Everything is better with a buddy! 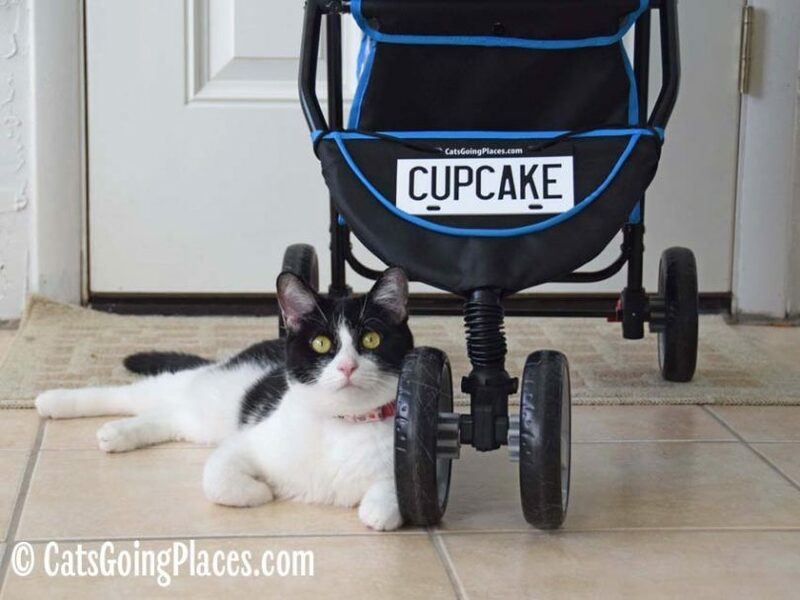 During our first outings with the Cupcake Cruiser, Cupcake wasn’t looking ahead at where her stroller was headed. 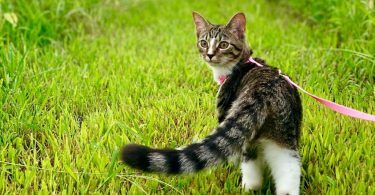 She tended to turn around to look out the back window at whoever was pushing her, as you can see below. As she got more comfortable with the idea that the stroller moved, she got in the habit of turning around to see what was ahead. 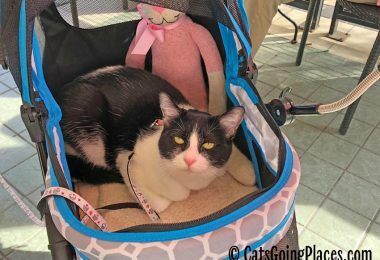 The more Cupcake spent time in the stroller at home, the more secure she seemed to feel in it when we took it out with us. 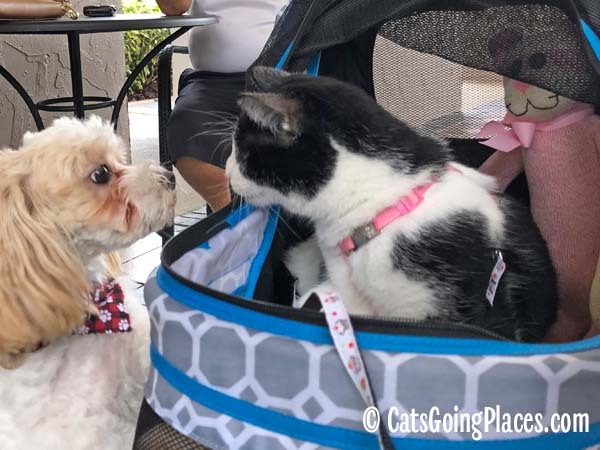 Whenever dogs come nosing over the edge of her stroller, she gets up to meet them. 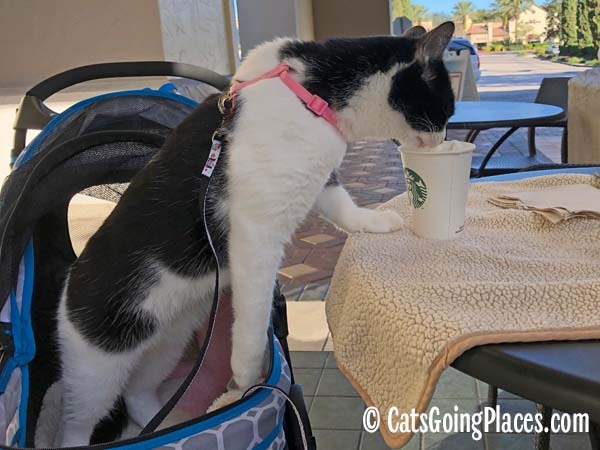 Wen we visit our coffee shop patio, Cupcake initially expected her whipped cream treat to come to her in the stroller. 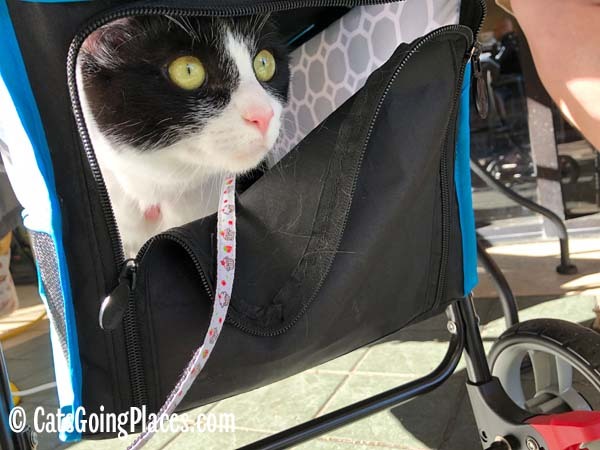 She soon learned that she would have to get out of the shelter of the stroller to enjoy it. 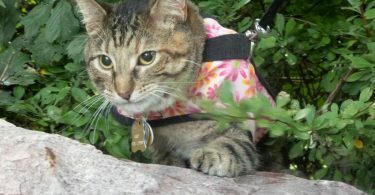 And she taught me that cats with front paws on the patio table can push a stroller into motion. I was reminded to use the stroller’s handy brakes to keep her from rolling herself away! 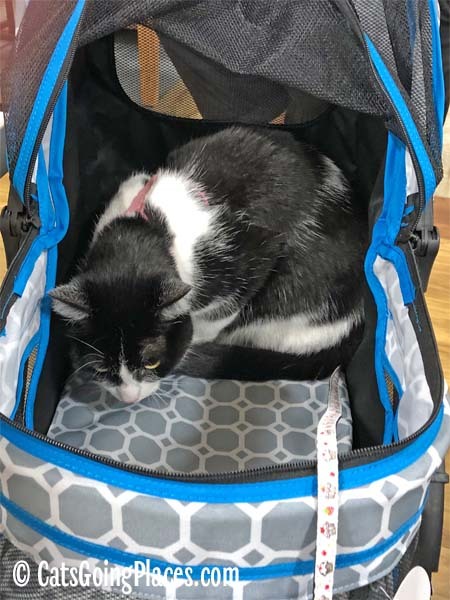 The stroller has a zippered storage area underneath, which Cupcake discovered I had not fully zipped one day when she was trying to get back into the stroller while she was on the coffee shop patio. There was no blanket or Catmonkey in the storage basket, so she wasn’t interested in hanging out there. I am still in the habit of carrying a bag for Cupcake’s stuff, but the zippered storage compartment would fit it all, which is handy. I have avoided loading it up with her stuff because I know I will have to fold the stroller to put it in the car, and that means removing bulky objects from the storage basket. The Cupcake Cruiser has come in handy when we go out shopping, too. She enjoys the comfort of it while visiting stores where I previously carried her. Having a space that she feels is her own definitely helps her confidence level in new places, and the stroller is a solid performer. 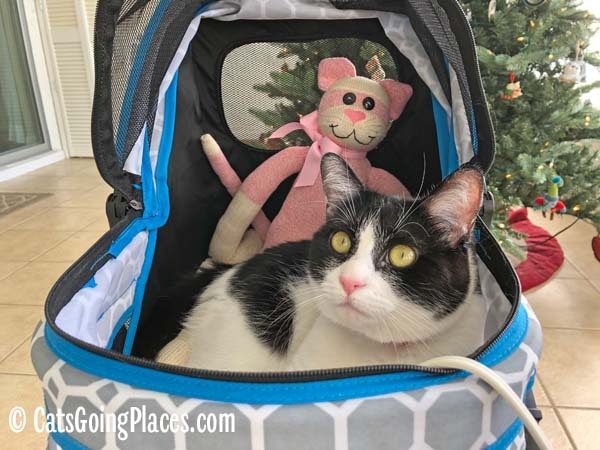 The eye-catching pattern on the sturdy fabric of Cupcake’s stroller gets her lots of extra attention since it seems to signal it doesn’t contain a human baby. I haven’t seen another stroller with this pattern of fabric, and I suspect it might be discontinued. It looks good next to Cupcake’s Tuxedo fur. The stroller goes out with us about twice a week, and it is holding up very well. Cupcake has a habit of stretching out and sticking her claws through the lower mesh, and it hasn’t created any snags or tears. I look forward to her rolling in the Cupcake Cruiser for years to come. 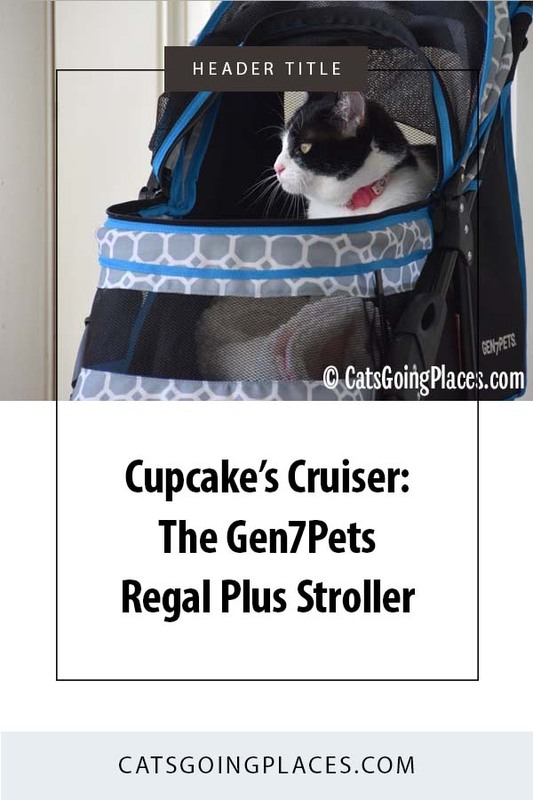 I purchased Cupcake’s stroller, and Gen7Pets does not know I am writing this. 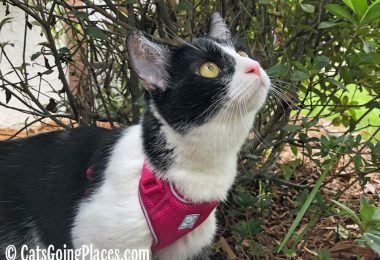 I’m sharing the review with you because I really love the product and believe it has been a good fit for Cupcake. This sounds really handy! Sadly, my human is still stroller-adverse. 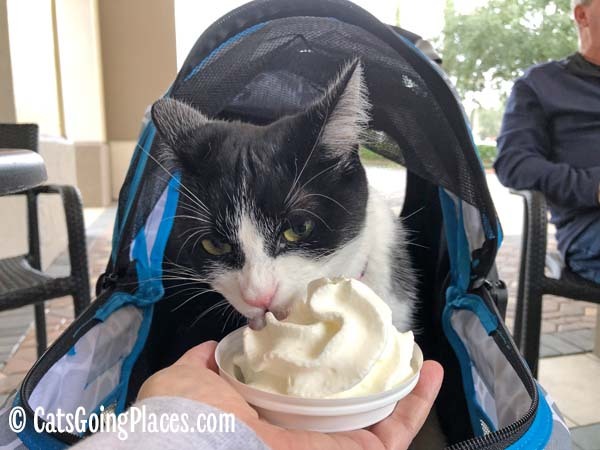 Wow, when you pointed out that Cupcake looked back at her person while she was getting used to the stroller I thought, “what a relationship home run!” She knows you’ll keep her safe. And once she’s more familiar, she can interact more with the world. How cool! I hope you have lots of great adventures with the new stroller. Gen7 is a new company to me. But I recently bought a folding ramp from them for the boat and I’m really happy with the thought they put into the design.